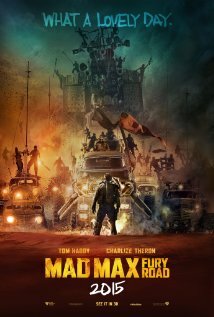 In a post-apocalyptic world, it's a mad house and in its midst we have Furiosa (Charlize Theron) trying to save women who are being used as breeding stock by warlord King Ammortan Joe (Hugh Keays- Byrne) and Max (Tom Hardy), just trying to save himself. Furiosa is trying to find her way home to the "green place" and taking the "breeding" stock with her, the "breeding stock" being willowy young things in diaphanous white barely there sarongs. When they were asked "Where do you come from?" Hubby leaned over and whispered, "Vogue." Yep. He was mostly right because one of the young women was model Rosie Huntington-Whitely. Furiosa is a tough one-armed cookie who drives a huge vehicle called the "War Rig." She rescues Max and they join forces to get the hell out of Dodge. King Joe, however, doesn't like it that Furiosa has made off with his harem so he and his " War Boys" are after her and the film becomes one long car chase. When the movie started, I kept asking myself, where is Max? Turns out he was the guy in the metal face mask being used as a hood ornament by King Joe and as a "blood bag" for his ghost-like "War Boys." I am a huge fan of Tom Hardy, especially since his bravura performance in the mesmerizing "Locke," but here all he does is grunt and get kicked around. I don't think more than 20 words were spoken in the first half of this film. Where is Mel Gibson when you need him? George Miller returns after a 30 year hiatus as writer/director of another "Mad Max" film, but this film doesn't have the charisma of the early films. Was it Mel? Or is there currently such a desire these days for blood, guts and explosions that he was trying to fill that need? The film is a series of non-stop desert car chases, explosions and guys running about with weird masks. The special effects (which aren't really CGI effects at all, but actual crashes) and production design steal the show: King Joe's world "The Citadel" was reminiscent of "Metropolis" and there is even a "Ten Commandments" type wave of desert sand. But car crash after car crash, car chase after car chase, explosion after explosion, no matter how well done, does not a satisfying movie make. I saw this in 3-D and I have to say that the film was actually marred by the 3-D. I didn't see the point. The film would have been much more tense without the 3-D, which I found distracting. 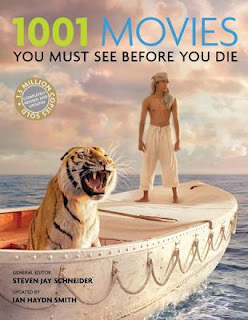 Maybe I would have liked this film better if I had seen it without the 3-D.
And Max? He seems to be tormented by something from another movie that is never explained and, he is certainly not in charge of his destiny. He is tossed hither and yon. It's definitely Furiosa's movie. I was a fan of the early Mad Max films because they were original and exciting. This film made me want to see those again. This new version has lost me. But I must add that I seem to be alone in this. Other critics are wetting themselves over this film. 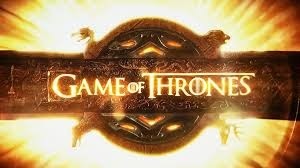 So if you like action, there is lots and lots of that so perhaps you should check it out for yourself. But remember, I warned you. Rosy the Reviewer says...The best things about this movie? Women as heroes. The worst things? Almost everything else. Baby Jupiter is born to Russian parents not realizing she is intergalactic nobility, destined to find the love of her life and save her people from an evil "soylent green" kind of future for earthlings. 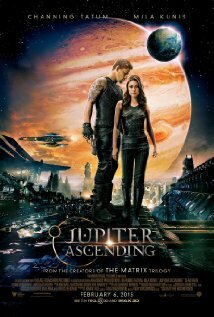 When we first encounter Jupiter (Mila Kunis), she is part of a Russian immigrant house cleaning team with her mother. She never knew her father, who was murdered, but knows that he was interested in the planets, hence her name. Though she cleans houses, she knows she is meant for something greater but she just doesn't know what. Yet. Her cousin comes up with this stupid plan for Jupiter to sell her eggs for some extra needed cash, which she stupidly goes along with, and as she lies on the table in the doctor's office, we realize something bad is going to happen to her, because the people in the egg donation clinic are really aliens (little do we realize in our everyday lives, the aliens living among us). Fortunately, she is swooped up by Caine Wise (Channing Tatum), a genetically engineered bounty hunter. And boy is he genetically engineered! Pant. Anyway, elsewhere in space, the House of Abrasax, the rulers of all of the planets, has lost its queen and her three children are bickering over who gets Earth. Somewhere along the line these kids figured out that Jupiter is their reincarnated queen so they want to get to her and kill her so they can have Earth for their dastardly rewards. So young Jupiter spends most of the movie running around trying to evade the bad guys, making bad decision after bad decision. It's one of those "You've got to be kidding me" and "Girl, don't go down into that basement!" kind of movie. I know. It's confusing as hell and gets more so. I can see why this didn't stay in the theatres long despite the huge hype before its release. This film has the colorful look and feel of Bruce Willis' "The Fifth Element," and the story is like an alien "Game of Thrones" with "Guardians of the Galaxy" and "Mad Max" thrown in. But any comparisons to those films does not mean this is as good. It's not. Mila Kunis is a gorgeous screen presence. And then there is Channing Tatum. What can I say? But their gorgeousness cannot overcome a script with so much going on you can't figure it out. Eddie Redmayne plays one of the kids, Balem, and steps out of his romantic ("Birdsong") and dramatic ("Theory of Everything") roles to play the villain here, using a raspy breathy voice to create his character and overacts like mad. If I didn't like him so much, I would demand he give his Oscar back. The special effects are cheesy and old-fashioned. You would think that writers and directors, the Wachowskis, who gave us "Cloud Atlas" and "The Matrix" films would have produced something more exciting and original than this plodding, cliché-ridden, overwrought scifi film that isn't even so bad it's funny. Rosy the Reviewer says...there's a reason this film came and went in the theatres before you could plop down your money. Heed such signs. A poor kid from a blue collar town tries to better himself by attending Annapolis. Jake (James Franco) is a boxer working as a riveter in a Chesapeake Bay shipyard, but his dream is to attend Annapolis which is just across the Bay. His mother always wanted him to go there, but his father and his friends think he's a loser and discourage him. He gets in at the last minute on a fluke and we follow our hero through his first year at the Academy...and if you have seen "An Officer and a Gentleman," you have seen this film, except this one isn't as good. The only reason to see this movie is to see a young, handsome and raw James Franco in one of his early films. Otherwise, it's a poor man's version of "An Officer and a Gentleman" with a little "Good Will Hunting" and "Rocky" thrown in. We have the usual abuse and culling process by the commanding officer (Tyrese Gibson) to see if our hero has what it takes to be an officer. But more than that, does he have what it takes to win "The Brigades," an annual boxing championship? Classic story of your roots holding you back. His father wasn't supportive of his trying to get out of the shipyard rut but of course, in these kinds of stories, his father ends up giving him his approval. All very predictable stuff. There is the usual cadre of guys in these kinds of films: the black guy, the Asian guy, the Hispanic guy, the fat guy who has to prove he can do the physical stuff and the young woman trying to prove herself in a man's world (Jordana Brewster also in one of her early movie roles). Why do military groups always include these stereotypes? Rosy the Reviewer says...the movie is a series of clichés, but see it for the young James Franco, before he became a cliché of himself. An Austrian couple, their young son and dog are on vacation at their lakeside home when two young men invade their home and wreck havoc. An operatic score plays as a precursor of the drama to come as a long shot from above shows our family heading to their vacation home pulling their sailboat. We are jarred out of our reverie by loud punk music, thus setting the stage for the disturbing home invasion to follow. Our family is settling in to their lake house when a young innocuous young man in white comes to the door asking to borrow an egg. He names the next-door-neighbor and the wife lets him in. Another boy soon appears and they terrorize the family. The symbolism of the young polite seemingly obsequious men in white highlights the horror that can exist behind a seemingly benign façade. This film is almost 20 years old, but is even more disturbing in light of the horrific similar home invasions over the last couple of years. It is also a filmmaking tutorial in how to make an extremely tense and scary movie without much graphic violence and blood. Why it's a Must See: "In this brutal and provocative 'home invasion' movie...Michael Haneke pushes viewers to the limit, forcing us to contemplate the senselessness of random violence, as well as our seemingly ceaseless fascination with watching it on-screen." Rosy the Reviewer says...if you liked "Straw Dogs," you will be riveted by this. This film is exceptional in its intensity and artistry, but is not for the faint of heart. 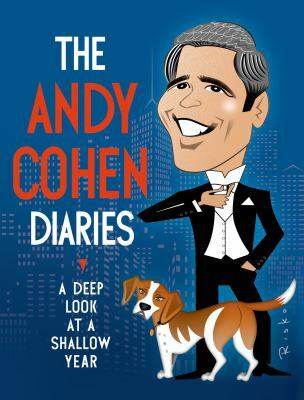 Andy Cohen was head of development at Bravo for over 10 years but resigned late last year to serve as executive producer of the "Housewives" franchise and to host his late night talk show "Watch What Happens Live." These are his diary entries from around the time of this transition. Andy weighs in on the Housewives and all of the people who appeared on his TV show. He name drops like crazy and dishes on everyone. It's like having a drink with your girlfriend. He talks about Lady Gaga appearing on his show and peeing in the waste basket in her dressing room and Andy turning the pee into perfume. He also thankfully shares which Housewives are a pain. Bitchy, gossipy and juicy - just what you would expect from the "King of Bravo TV." But it's candid and heartwarming as well as he shares his search for love and finds the love of his life in his new dog. Rosy the Reviewer says...If you are a Bravo fan (especially of "The Housewives") or you just enjoy pop culture, this is a must! 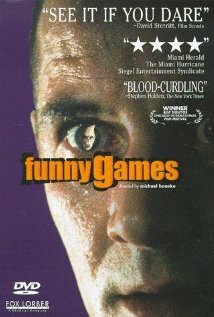 Funny Games is indeed a chilling movie. Of the various Haneke films on the list it's, well, I wouldn't use the word "favorite" since I'll never watch it again, but it's definitely the one I felt had the biggest impact on the viewer. The man who played the father is in a terrific movie named The Lives of Others (2006), which is also on the 1,001 Movies list. If you have not seen it yet then I highly recommend it. Thanks for your comment, Chip. Funny Games is still resonating with me. And yes, I have seen The Lives of Others but did not make the connection between the actors.